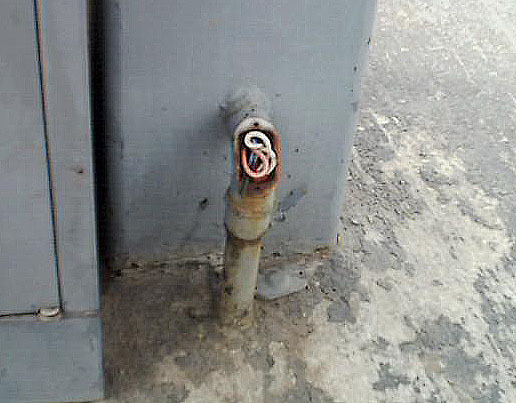 Register Log In ECN Forum Forums Violation Photo Forum Hazardous Location? I Think I've been to this gas station. It is just up the road from the one that had a gasoline dispenser wired with Romex & since the built in switch was broken, had a plain old light switch to start the pump. Ain't electrical work in WV just great? The dispenser I mentioned was taken out of service after I pointed out the hazards to the owner. The installer of the dispenser (a gasoline wholesaler) felt theere was nothing wrong since he hasn't had any explosions, yet. I've finally started carrying a camera around. Maybe if I make enough $$$ this year, I'll get a digital one.I do a lot of service calls & inspections so I get to see some real dandy work. Hey Tom, between us, with help from our location and "mining electricians" (flame magnet?) we should be able to keep as many violation photos up as Bill and Joe! I don't think the area in question would be Class 1 Division 1, I think it is Division 2 and if so the fitting in question would be ok for the area(if it didn't have splices and had a cover).